Remarkable features: In keeping with the instructions of Alexander III, the church was designed on the model of old Russian Orthodox churches in Moscow and Yaroslavl, constructed of XVI-XVII centuries. Therefore, the similarity with St. Basil’s Cathedral on Red Square is not accidental. 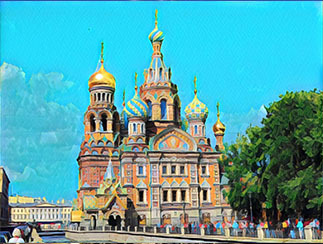 Symbolic meaning: The church is a memorial to Alexander II. The emperor, who abolished the serfdom, was wounded mortally in this place on March 1, 1881 because of the eighth assassination attempt on him. At the bottom of the church, there are the granite plaques with the main events of his reign. On the bell tower, you can see the emblems of the Russian cities and provinces – the symbols of national grief for the murdered emperor. The pavement, where the emperor fell after the fatal explosion, was preserved inside the church. The cathedral is decorated inside and outside with more than 7000 square meters of mosaics. Interesting facts: In Soviet time, the Bolsheviks wanted to blow up the church, and only the beginning of the Great Patriotic War (1941-1945) broke down their plans. Before the War, a vegetable warehouse took place inside the church, during the War there was a morgue and after – the place for scenery of Small Theater of Opera and Ballet. Cathedral reopened to the public only in 1998. About Museum: The cathedral functions as a museum. Working hours: 11:00 a.m.-18:00 p.m. (in summertime 11.00 a.m. – 22:30p.m.). Day off: Wednesday. Tickets: adults – 250 rubles, students with ISIC – 150 rubles. Attention, from 18:00 prices double, no discounts.